After Eudora spoke the last words triggering the colossal spell from inside the pass, waves of thunder rolled and echoed above the misty vale. The mage, however, didn’t hear it, as she had instantly collapsed onto the path that now led only back down to the small town shrouded in mists. The pass itself was blocked by a dense wall of mist that surrounded the entire valley at that altitude. To the rest of the world, the tiny town of Misty Vale had never existed; even the four wizards who had helped lay the foundation for the spell no longer remembered their contribution. 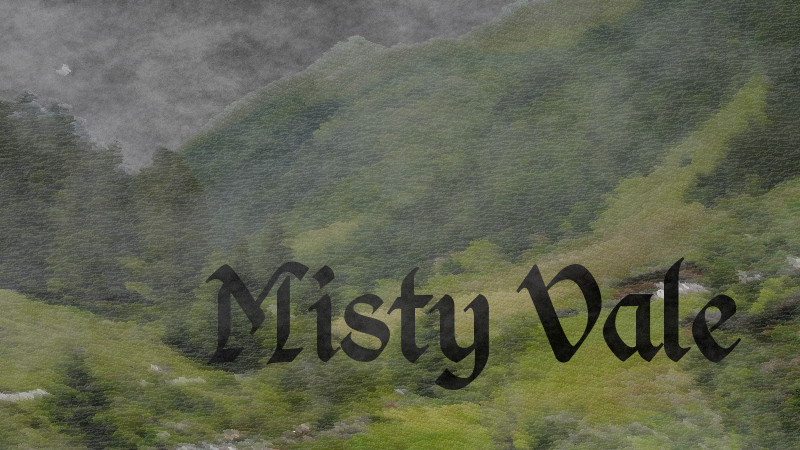 While Eudora remained unconscious at the top of the path, Misty Vale began to wake. The roosters crowed in the few scattered hen houses. The cows mooed in the largest barn, impatient and uneasy from the thunder. Then a baby squalled. At that time, there was only one baby in the tiny town and she was both loud and demanding. It was as if something inside her knew that she was a princess and destined to be queen. The only living heir to the throne of Vestony, a kingdom stretching from the eastern side of the Skawbrake mountains in which Misty Vale was nestled, across the grassy plains on which the shaggy, tri-horned burble graze, all the way west to the great Kattehav Sea. The protection of Princess Regina’s life is the reason for the spell now cutting Misty Vale off from the rest of Vestony, and only two things could end it: Princess Regina’s sixteenth birthday or her death. As her crying faded, a man with short-cropped gray hair and a sword hanging on his hip emerged from the largest building in the town–a small tavern. After quickly surveying the area, Brent walked warily, though with a slight limp, towards the adjacent paddock. His sharp whistle as he opened the gate brought a pitch black stallion galloping out of the mists. A few red draft horse mares followed at a slower pace. The man quickly led the stallion into the nearby barn, leaving the mares pacing and whinnying behind the shut gate. After returning to the muddy dirt courtyard, he quickly mounted the now saddled horse and they set off in a brisk walk up the path that now led nowhere. As he rode out, several men and a few women came out of their homes into the slowly brightening day to begin caring for the animals on which their lives so heavily depended. The sun quickly thinned the mists around the houses, but the mists clung to the wooded slopes that ringed the valley. Eventually a figure appeared from the mists. Brent, limping more heavily, leading the black horse, Eudora’s body slung over the saddle. Shouts erupted when the workers noticed him and soon the entire village–17 men, women, and children, including the limping man, the unconscious mage, and the princess–clustered together. Although everyone knew the thunder that had awakened them must have been the great spell taking effect, they were still shocked into silence at the confirmation. Each one of the adults had made a commitment to give up the lives they had led and move here, to be bound into a protective prison with Princess Regina by the spell. Several others, though dedicated to the cause of protecting Vestony from the greedy usurper Michæl Ballademager and his minions, had balked at potentially committing sixteen years of their life to hard living in seclusion. These outsiders no longer remembered having been asked; nor did they remember that Princess Regina hadn’t been killed along with her mother in a carriage “accident” shortly after her birth. Brent’s voice again rose above the group. “Thom and Joe, carry Eudora into her room above the tavern. Sally and Rosemary, do what you can to make her comfortable. She warned us backlashes could happen with so much magic and an untried spell.” Everyone hurried to do as he ordered. As he’d been named leader of the Veston Royal Guard by the late King Anton, he was the closest thing to a leader the group had. Only Princess Regina and Thom had any noble blood, and Thom’s family holdings were among the first to fall to Ballademager’s scheming. Everyone else, except Eudora, were common folk, those best suited to making a life in this remote valley. “Back to work, the rest of you. If we don’t get ground broken and seed planted, nothing else will matter for long. Keep your weapons handy, just in case.” Everyone scattered quickly at that threat. Once finally alone in the dirt courtyard, Brent leaned his head into his horse’s neck and wept. He wept for the people he left at the mercy of a despot. He wept for the loss of King Anton and his gentle Queen Valeria. He wept for the grief of the families the group left behind, who would now mourn not only the royal family, but their own loved ones the spell should have made them believe lost. The horse carefully took the cube with his lips then rubbed his forehead on Brent’s chest. “Come on, boy. I’ve got work to do and your ladies are waiting.” Brent led Tarfeather into the barn, removed the tack, and released the former warhorse into the paddock. Then he buried his feelings again, as he’d been trained and set off for the tavern. The first week in seclusion passed quietly. Except for the continued worries about Eudora not waking up, everyone settled into a routine. Brent quit posting guards in the pass, but Edmund, their hunter and tracker, made frequent checks for signs of disturbances. Most of the daylight hours were spent breaking ground, planting, and caring for the livestock. Being primarily trained for fighting and battles, Brent wasn’t so useful in the fields. Instead he spent much of his time in the tavern either downstairs where everyone could find him if issues arose or upstairs by Eudora, awaiting signs of her return to consciousness. He read to her, in these quiet moments, from the book she once confided was her favorite. Just in case it could help her recover. Thom nodded, relieved by Brent’s confidence, then hurried out the door, leaving it banging in the wind. Brent took a moment to collect himself, shoving memories of his own past back out of his thoughts. Rosemary half supported Mary as they struggled to walk around the room to hurry the labor. Mary’s blond hair was falling out of its braid and sticking to the sweat on her face. Likewise her nightgown stuck to her sweaty body. Sally approached with a steaming mug. “Drink this, dear. It’ll ease the pains a bit.” She and Rosemary helped lower Mary into a chair then Sally handed her the herbal brew. Mary slumped in the hard-backed chair but managed to hold the mug with both hands and sip. “I don’t think I can do this,” she confessed between sips. Then another contraction hit. The ceramic mug crashed to the floor and broke to pieces. Mary grabbed at the wooden arms of the chair as she screamed in pain. Thom slammed the door to the bedroom open, hurrying to his wife. “It’s just a contraction,” Sally said to him. But Mary fainted, her body sliding to the floor amidst the shards of the mug and the puddle of herbal tea. “Thom, where are you going?” Brent yelled as the younger man approached the wall of mists. “To get help. I’ve got to save Mary!” Thom continued to move forward. “But it’s days to the next town. She needs you by her side.” Brent pleaded. Brent tried to stop him but managed to grab onto the edge of Thom’s cloak. But it disappeared from his hand when Thom took the final step into the misty wall. Brent’s hand fell to his side and his head dropped to his chest. He sighed. After several moment’s rest he turned and started back down the trail. “I made it,” Thom yelled triumphantly from a distance. The only answer was a frustrated shout he couldn’t turn into words. But it sounded closer so he kept running along the border. A moment later he broke into a small clearing only to see Thom, the bottom his cloak ripped and torn, again disappearing into the mist. Brent stood, puffing, catching his breath. He again heard an anguished cry from a distance, but knew he couldn’t catch him. He turned downhill and slowly limped back to town, his limp much worsened by his desperate run. A small man with red hair and a heavy beard looked over a small flock of sheep as they grazed partway up the eastern side of the valley. A black-and-white dog ran around the outer edge of the flock, gathering in the stragglers that were heading higher up the hill. The man and dog team prepared to take the sheep down into the valley as the sun went down. “Joe!” Brent yelled as he made it onto the small plateau where the flock gathered. Joe scrubbed his arms and hands under Sally’s watchful eye. “You sure ‘bout this?” he asked her. Sally and Rosemary had positioned Mary sideways on the bed. Mary was only partly aware of what went on around her. Exhausted from the day of labor, she’d collapse into a fretful sleep between contractions, only to awaken crying or screaming. As Joe tried to adjust the baby’s position, Mary screamed and kicked at him. At the same time, Thom burst in the door, clothing in tatters and his face and arms crisscrossed with scratches. He bared his teeth like a rabid wolf and curled his fingers like claws. His angry glare focused on the man his wife was kicking. Growling, he grabbed Joe and dragged the smaller man away from Mary. Joe struggled to get to his feet. Brent entered just as Thom landed a solid punch on Joe’s jaw. Joe collapsed onto the floor. Thom shook Brent more violently. “Vestony? I’m talking about Mary, saving Mary. Saving our baby. Tell me how to end the spell.” Thom reached for his dagger with one hand, giving Brent the chance to break free. Thom howled and ran from the room. Mary sobbed as another contraction hit. Joe nodded and went to wash his hands again. Brent spoke quietly with Sally then left to find Thom. Thom quietly approached the crib, skirting the moonlight streaming in the window. “Mary. I must save Mary,” he muttered over and over. He held his dagger in front of him at chest height with the point downward. His knuckles were white from the tight grip and nervous sweat drenched his hair and back. Thom looked down at baby Regina, asleep on her back, red curls peeking from the edges of her bonnet. “For Mary. For our baby,” he chanted as he positioned the dagger above her chest. Regina opened her green eyes and looked up. Thom steeled himself, continuing his chant, then thrust. Lightning glinted in her eyes. Thom froze, the dagger tip an inch from her body. A tendril of mist began to envelop the dagger. Thom struggled to finish his thrust, the chanting now only in his head, as no sound escaped his slightly open mouth. “Mary. Our baby.” The mist spread, shrouding his entire arm, rising from the floor to engulf his feet. The nursery door crashed inward as Brent broke the lock, pleading, “Thom, Don’t do it!” But he was too late. Only Thom’s head still emerged from the mist. But he couldn’t move, not even to stop or step away. The mist coalesced around his face. Brent couldn’t move either. He could only watch Thom’s hair disappear in the mists. Lightning flashed, blinding Brent. Thunder again rolled and rolled above the valley. When his vision cleared, only he and baby Regina remained in the nursery. There was no sign of Thom or the dagger. As Brent neared the crib, Regina began to cry. It was a hungry cry, not a scared one. The magic had drained her energy as it kept her safe. Sixteen men, women, and children remained in the protective prison of Misty Vale. Only two things could end the spell: the princess’s sixteenth birthday or her death. But she would not be murdered. This story was originally written August 2017 for a small contest, which it won. It’s the story that brought me back to writing after an extended hiatus triggered by health issues and big changes in my life. I later followed this story with a few more chapters of their adventure as a serial, but I’ve stopped doing that because I’ve decided I want to do things right and make a proper novel–or perhaps more than one–in the world I created here. I’m not writing quickly because my health is always going to be a factor. I can’t type too much or I get pain in my hands and wrists and have to rest them for weeks or months, and I can’t find a voice tool that doesn’t frustrate me too much. But I am working on it slowly and steadily, while also writing a variety of other things.